If one of your ancestors served with the Royal Hampshire Regiment during World War I, you may be interested that you could discover more about their experiences on the battle field by examining the war diaries of the unit they served with. Access to the archive is on an appointment only basis and you may be charged a small fee for that access. If you can’t get to Winchester then the museum has a research facility, although it cannot research an individuals service record. There is a fee for this excellent research service. The archive is held at Serles House in Winchester which also houses the museum and memorial garden for the Royal Hampshire Regiment. We have all been moved by this years Remembrance Day, so many people have been posting on social media networks, pictures of their family members who served in WWI. Project Operation War Diary seems a good way to make sure our engagement isn’t fleeting and that by showing that if we each do a little, we can all achieve such a lot. 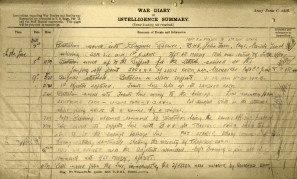 The war diaries of the British Army serving on the Western Front are being released from the National Archive and with the expertise of the Imperial War Museum a Citizen Historian Project has been instigated to classify each page of the diaries to reveal new data and connections. With careful interpretation, the diaries can help the family historian begin to piece together the story of an ancestors war experience. 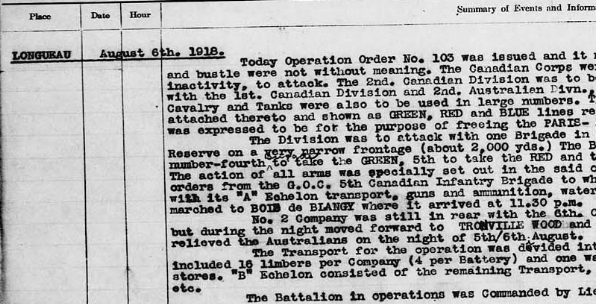 Anyhow, take a look at Operation War Diary and become a Citizen Historian for the World War I centenary. You can choose a diary to work with, a tutorial gets you started and you can do as much or as little as you want. Citizen Historian projects are a great way of cracking through large amounts of data that otherwise would be left in the archives. Once the job is done the diaries will be free to look at through the National Archive and can be downloaded for a small fee.